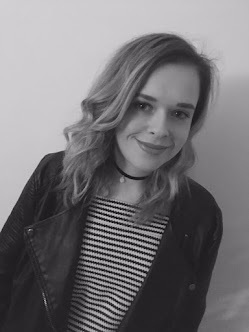 I started blogging in May this year, i was unsure at first which direction to take my blog in. I feel now that my blog is heading in the right direction, one which is suited to my interests and my hobbies. Through my blog i have had the opportunity to meet some people who share the passions and interests as mine. I have enjoyed every moment of my blogging this year, even when i have lost a few followers on Twitter through tweeting too much about my blog. I am looking forward to blogging in the new year, i have lots of exciting posts planned for 2014. I hope you have enjoyed reading my blog and stay on my journey through 2014. I have been blogging for over six months now so i thought i would do a giveaway. It is something that i have wanted to do for a few weeks now but i was unsure of what to giveaway. I have seen lots of giveaway's on other people's blogs so i wanted to do something slightly different. I decided to do an handmade giveaway, i love handmade presents and gifts. I think homemade shows you have really thought about it and is always different to what you find on the high street. The first prize is a t-shirt and a scrunchie made by Kelly. You may have caught my previous post about my sisters creations Here. She makes and renews clothing and accessories, it is only early days but she has allot of creative ideas ready to make! She has come along way in the past two months that she has been crafting. The t-shirt is a unisex medium, which is perfect as you can wear this over-sized if you are a little smaller. I usually wear the t-shirt with some jeans and some trainers. 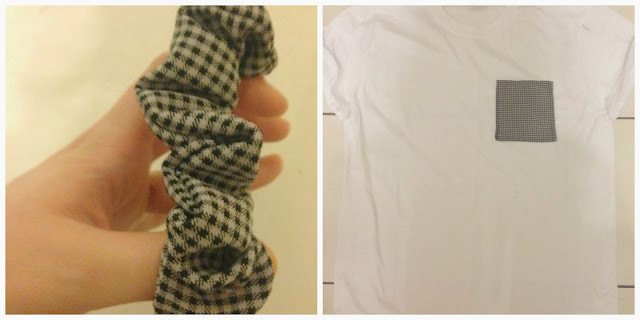 The scrunchie matches the material on the t-shirt pocket so it is an outfit ready to be worn. The scrunchie is perfect for long and short hair, as it works perfectly well with my medium length locks. 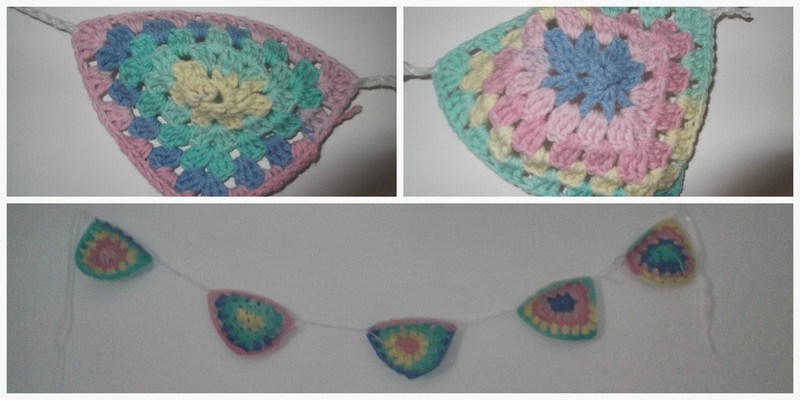 The second item in the giveaway is an handmade item by myself, it's mini crocheted bunting. I have not really talked about my crocheting on my blog as i am unsure how to put this in a post. Crocheting is a hobby of mine, i have been crocheting for two years now, i can make blankets and cushions. All of my family and friends all have there very own hand-made blanket by me. I make them for peoples birthdays presents, i love seeing how happy people are when they receive them. I recently made myself bunting for my bedroom, i thought i would make the same for my giveaway as i loved it so much and i hoped other people would too. I love the pastel colours of the bunting i think it makes my room look super cosy and gives a homely feel to my bare white walls. As i find something on my walls can brighten the place up, as my bedroom overlooks the south so i miss out on the sun shine gleaming through my windows. I have not seen any bunting like this so i think it is really different and would sure bruce up anyones bedroom! Awesome idea kirstie!! Some excellent posts of late as well. We met briefly at the lush bloggers event I believe. Nice yo be able to keep in touch via twitter and blogs. Here's to the next year! !